Every Monday, Wednesday and Thursday, 112 students flock to the music center for choir rehearsal. For the last month, rehearsals have had a singular focus: the Winter Choral Concert. This annual event will be held Saturday, Feb. 9 at 7:30 p.m. in Sauder Concert Hall. The eclectic cold-weather concert falls exactly one month after the start of spring semester, which is just enough time for Goshen’s three choirs to master new repertoire. This weekend’s concert will feature performances from the Women’s World Music Choir, Chamber Choir and Men’s Choir. Deb Detwiler, director of the Women’s World Music Choir and Chamber Choir, is looking forward to Saturday’s performance. “As always, I’m excited to present new songs from different cultures and composers that may have something new to say to our audience,” Detwiler said. As the name suggests, the Women’s World Music Choir, which features 72 voices, centers their work on music from countries around the world. “I always tell the students before a concert that they have a gift to offer that people need to hear and may not even know they’re looking for,” said Detwiler. 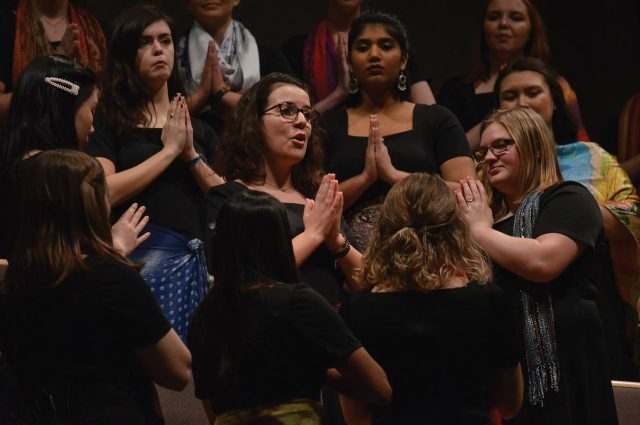 Among the selections from the Women’s World Music Choir is “Baba ni Mungu,” a Tanzanian melody that 2012 Goshen College graduate Jay Mast brought back from SST. Detwiler recruited junior Elinor Keener to arrange the song for the choir. The Chamber Choir, made up of singers from the Men’s Chorus and Women’s World Music Choir, will perform four pieces. Of the four, Detwiler said that listeners are sure to enjoy the “thick harmonies, strong energy and great soloists” of “Hold On,” another gospel tune. The Men’s Choir, directed by Joshua Boggs, will offer four pieces as well. He speaks highly of all the repertoire for Saturday’s concert, but “My Soul’s Been Anchored in the Lord” is a personal favorite for Boggs. “It is a lively arrangement of an amazing spiritual. I have fond memories of singing the work under Anton Armstrong at an honors event when I was a bit younger,” Boggs said. “I would have to say “My Soul’s Been Anchored” is my favorite,” Goswami said. The traditional spiritual was arranged by the late Moses Hogan, a popular American choral composer and arranger in the ’80s and ’90s. “I like Moses Hogan,” said Goswami, commenting on the satisfying clash of harmonies featured in “My Soul’s Been Anchored in the Lord.” The surge of energy that singers feel “when the harmony hits” is one thing Goswami said he loves about singing in choir. “The winter concert is one of the only concerts that is not ‘themed’ or ‘holiday-specific,’ so I think audiences can expect anything!” said Boggs. Tickets are $8, $6 seniors/students, and can be purchased online at goshen.edu/tickets or in person at the Goshen College Box Office. GC faculty, staff and students are free with ID. The event will also be live-streamed at goshen.edu/live-stream.